up for themselves teachers, and they will turn their ears from the truth…” (II Timothy 4:3,4 NJKV) You see it is no longer a negative thing of “we are trying…our heart is in the right place…but we just cannot reach perfection.” No, that is not it! It is a positive matter of first, a lack of tolerance for sound doctrine–church members will not listen to sound doctrine, church members will not go to hear sound doctrine, and church members will not tolerate preachers and teachers who preach sound doctrine. Church members, according to the Apostle Paul’s description, are motivated not by any effort to be like Christ and any effort at perfection, but are motivated by their own human desires; that is, “according to their own desires,” and “because they have itching ears.” In short, church members are doing what they want to do and they are believing what they want to believe. What they want to believe is things that will tickle their ears. Things that will give them pleasure like, “nobody is perfect” and “you are the people of God”, and “at least you are trying”. Maybe 20 or 30 years ago that was true; but not now. And the apex of the gap in Paul’s description is that they pile up or heap to themselves teachers. It is much like building a dirt fortress or batiment around themselves in order to protect themselves from sound doctrine. They buy books from teachers that feed their desires; they run off teachers and preachers that offend their itching ears with the truth; and they call as pastors, teachers, and administrators those “teachers” that will teach according to their own desires. The whole motivation is to turn away from the truth. Now, brother, that is a positive thing. It takes a lot of effort for so-called “Christians” to turn away from the truth of the Bible. It takes a lot of effort for church members to cease to Learn Christ; and in the place of learning Christ to learn some kind of church membership that is based on “desires” and “itching ears”. Some today, like among Presbyterians, are worried about an intolerance caused by the preaching of Christ as the only way of salvation. Brothers, you had better be concerned about the intolerance of sound doctrine that is growing. Being the third volume of the LEARN Christ commentaries, it is centered around the five books of the Apostle John with the emphasis on the book of Revelation. This approach helps to support the title theme of “Christ for Individuals”. As churches and denominations are “falling away” from God, Christ, and the Bible (not falling away from churches as church attendance may actually go up during the falling away), it is important that the few sound doctrine church members remaining of the seven Christian thousand adopt to themselves the Christ of the individual that is presented in Revelation 2-3. The approach to the eschatology of Revelation is simple. The outline is taken from the teachings of Jesus as given in Matthew 24 with the major divisions of the History of Christianity all the way to the end given by the natural divisions of“and then”: (1) Beginning of Sorrows; (2) Period of Persecution Tribulation (the tribulation of the fourth period is primarily physical tribulation and from God as the heavens and earth fall apart, the shaking of heaven and earth); (3) The Period of Offences, often the most neglected, when God’s people are offended by sound doctrine, betray and hate one another; and (4) The period of the Falling away which includes lawlessness and all the end time events. Remember, however, that whatever is in one period continues into the other periods. In the Table of Contents of CFI, Christ for Individuals, you will notice the 3 major divisions of (1) The Book of Revelation., (2) The Gospel of John, and (3) The Three Little Epistles of John. (Actually John’s little epistles are harmonized in part 3 to once again illustrate the harmony between John and Paul in 3 each little epistles, and to set forth both Faith Contending and the Security of the Believer. chapter 10: Revelation, the Gospel of John, and the Epistles. You are welcome to receive the CFI book by free PDF download from the SunGrist website, or order it from several bookstores included the two listed below of Amazon and Barnes and Noble. If you wish to own CFI in a paperback to increase or start your Bible book library, you can get it at a number of local bookstores including Amazon.com and Barnes and Noble. 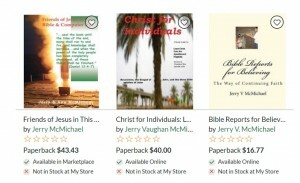 (a) On Amazon.com at https://www.amazon.com/Christ-Individuals-Learn-Commentaries-Apostle/dp/0692120556/ref=sr_1_1?s=books&ie=UTF8&qid=1538746170&sr=1-1&keywords=Jerry+mcmichael and (b) on Barnes and Nobel at https://www.barnesandnoble.com/s/Jerry+McMichael?_requestid=3937941 . Note: SunGrist appreciates the many book stores and distributors that distribute these books, especially in Ireland and the UK because worldwide distribution is the prime goal; however SunGrist would like to share some of the profit. Choose Prime on Amazon.com if you wish to share the profit with SunGrist. Thank you. 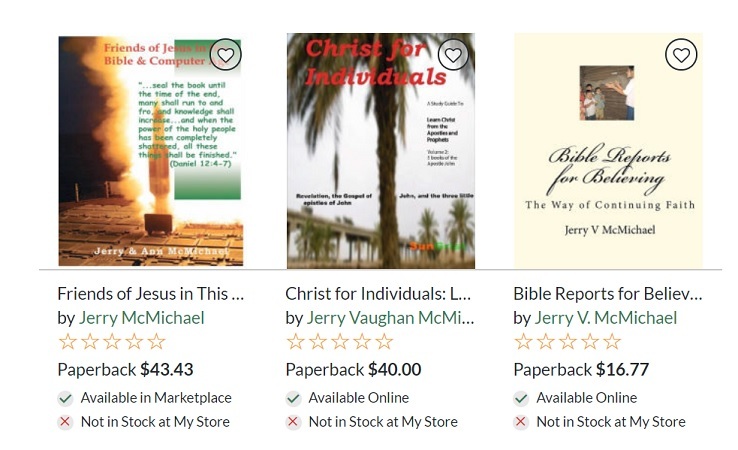 Free Downloads Complete 7 volume set of the Learn Christ Bible Commentaries, Plus. Gospel of The King and Kingdom from Romans and Hebrews. ONE Chapter 1: Introduction to the ONE Commentary. MaryVex on THE BIBLE IS ONE! malleco.info on THE BIBLE IS ONE! Administrator on THE BIBLE IS ONE!